I woke up Saturday morning planning on going for a paddle early but I was just too tired. Luckily I could go on Sunday, so I delayed my plans. If you’ve read recent posts, I’ve mentioned the wind. That meant getting out early on Sunday. I was in the water by 10 AM (guess it’s not that early) and I only felt a slight, inconsistent breeze on my face before leaving the dock behind me. It was a negative tide and I didn’t want to be way out near the main boating channel (which ended up happening anyways ), so I went south towards the Dumbarton Bridge. I was feeling pretty good and was thinking of going further but I decided to turn into the wind and see how it was. I was going to have to go against the flow and the wind on the way back. I turned north and was surprised at the whistling of the wind through my ears! There were a few whitecaps but I guess I hadn’t been watching the elements close enough. I decided to turn back. It was looking (and sounding) like the whitecaps were picking up. I have to say it was blowing pretty hard and I was a bit surprised because high winds weren’t expected until the afternoon. I went from 4.4 mph pace to about 2.7 mph on the way back. I got a pretty good workout, but worst of all I got chafed pretty bad around my shoulders. It was such a nice, sunny day I only wore my farmerjohn and pfd (and sunscreen of course). It was time to get some sun on those arms and get rid of my “farmer’s” tan. My pfd ended up rubbing the skin off my left, anterior shoulder. I paid for my vanity. After loading up for the drive home I checked the marine weather report, and there was already a small boat advisory due to wind for the next 24 hours. That advisory has continued for most of this past week. 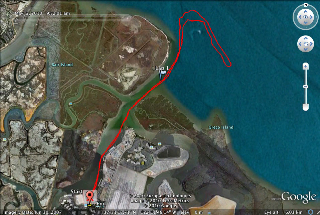 If you look at the satellite image above it looks like I did a pretty strange route, but actually the route was due to the tide being so low. All that water in the image is actually land or water so shallow I couldn’t paddle without the blade hitting the bottom. eat well, sleep well………..paddle fast! This entry was posted on May 7, 2010 by DummyDiva. It was filed under Uncategorized and was tagged with kayaking, outdoors, paddling, training. As a general rule on windy – but still paddleable days – I will start into the wind so I have a push back when I am tired. But at least you got out. I have been pinned by wind for over a week.